"...exceptional, inspiring designs for a new bridge at the centre of the world’s greatest city. The successful entry will have to win the hearts of Londoners who are tremendously proud of their river and its rich architectural heritage. There are considerable challenges and engineering feats to overcome. The design must work alongside the cutting edge architecture emerging on the south bank as well as the elegant frontages on the north. The landing points on both sides must integrate sensitively with their surroundings and provide a smooth and safe experience for the pedestrian and cyclists who use it. This bridge is also a badly needed and valuable piece of infrastructure for London. It has a very strong transport case, will support the city’s growth and has significant funding commitments already in place. Developing an inspiring, beautiful design will allow us to take the project to the next stage and ensure this project comes off the page into reality in a much shorter timeframe." Architecture and design is a question of taste. What I like might not be what you like. I'm not going to bother talking about which designs appeal to me. Here at the office we started looking at the bridge from the mobility perspective and, as is our lot, from the perspective of citizen cyclists who want to get around their city. Basing our focus on the many bicycle bridges in the Netherlands and Denmark. In particular, Copenhagen has seven new bicycle bridges either just openend or on the way. Leaving the personal taste up to the individual, we looked at pure mobility. Like Ravi Govindia says, above, it's a badly needed and valuable piece of infrastructure with a strong transport case that will support the city's growth. It has to provide a smooth and safe experience for pedestrians and cyclists. - "...it must be inspiring, elegant and functional in its design and perfect in its execution." - "Provide a safe and attractive link for pedestrians and cyclists crossign the river, encouraging movement between the two banks." I'm not really a big fan of architects dabbling in urban planning. So few have the knack for it. So, with that in mind, what is the State of the Architectural Bridge Nation? What is up with these squiggles?! It's perfectly fine to think out of the box. Not much gets accomplished if you don't. 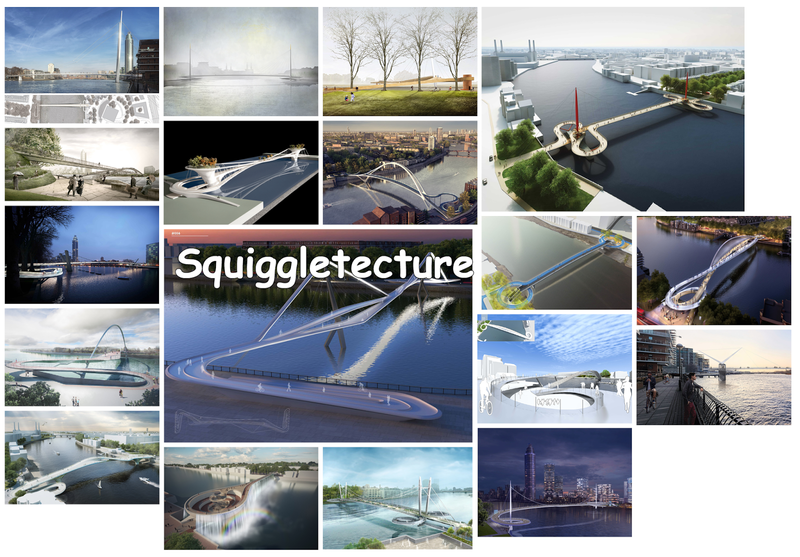 But there is a clear, and perhaps, disturbing trend which I have hereby dubbed Squiggletecture. There is an alarming number of renderings that have discarded straight lines. What is a bridge? Isn't it just a vital mobility link from one side of a body of water to another? Isn't that really the baseline for every decent bridge in history? Look at a map of Paris or any other city with bridges. They are straight. From one shore to the other. Providing no-nonsense A to B for the people using it. Only then do differences in design and aesthetics come into play. Look at the selection of designs, above. A2Bism had a cement block chained to its feet and it was thrown into the river. It's sleeping with the fishes. You wonder who thinks stuff like this up. Are they all former interns at Foster + Partners? Wherever they cut their teeth on Photoshop, it is clear that these are people who do not ride bicycles in a city - or who didn't even bother trying before they started doodling a bicycle and pedestrian bridge. Let alone people who walk very much on their urban landscape. These are all designs for meandering tourists licking ice cream on a Sunday afternoon. People with nowhere to go and nowhere to be. These aren't designs for a city in constant motion and citizens moving purposely about. The ramps. Seriously. Look at all those squiggletecture ramps. Round and round we go, slowly descending to the river bank like a flower petal on a summer breeze. Not exactly what any human in a city wants, now is it? Then look at some of those sharp turns on the bicycle ramps. Best Practice for grade and curves on bicycle infrastructure has been around for almost a century. Would it have hurt to spend a little while on Google? Or on a bicycle? Unbelievable. One of the designs has a fancy waterfall - bringing inspiration to London from.... 1980s Edmonton, Canada. But really, the water is a visual shield to disguise the Danteesque inferno in the middle that forces cyclists to descend to several levels of mobility hell. Here's a thought. Is this pornographic obsession with ramps a subliminal product of decades of car-centric planning? Is there a little voice embedded in the minds of designers and architects that says, "hey... if you have get up or down from an elevation, use a winding ramp. That's what they do in car parking garages and on motorways..." Has car infrastructure dominated so thoroughly that it's hard to plan for other forms of transport? Whatever. These designs would be great for a Bridge Over the River Why. London certainly doesn't need anymore of this. It is apparently easy to draw a (curved) line between Illustrator's improvement of their Draw a Curve function and design renderings. There are only 30,000 hits on this how-to film, but I bet 10,000 are from people responsible for the all the photos about this point. I can lament the fact that there is so little anthropology at play in architecture but assuming that anybody who walks or cycles in a city is a meanderthal shows a lack of understanding of human nature. Stop with these curves, already. It's Magpie Architecture, nothing more. Bling your badass bridge all you want, just don't force people to alter their urban trajectory because you learned a new trick in Illustrator. There will always be exceptions to this. The new Circle Bridge in Copenhagen by Olafur Eliasson is one. It is not at a location, however, that is - or will be - a vital mobility link. It's just a modest connector bridge across a canal for cyclists and pedestrians. Any bridge that is expected to get a decent share of cyclists wouldn't be designed like this. Ah, you might say. What about the Bicycle Snake/Cykelslangen in Copenhagen? Isn't that curvy and all that? It is, indeed. Firstly, it has to navigate a 90 degree turn around the corner of a building. But you don't force cyclists to do 90 degree turns, so they swept it elegantly around the corner for comfort and safetly. The bridge slopes down to the harbour bridge and, with an expected 16,000 A to B cyclists a day, the graceful curvature nudges people ever so slightly to keep their speed in check on the descent. 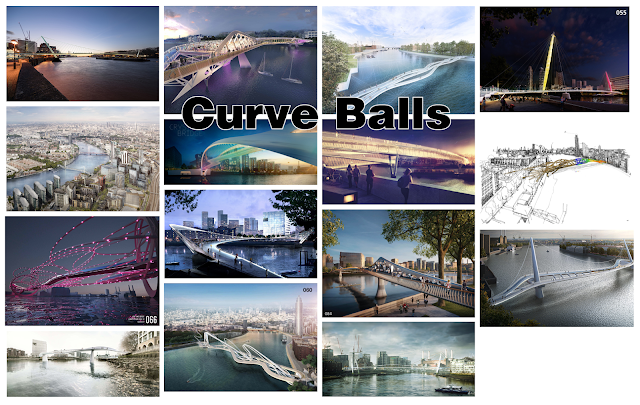 The designs for the NEP Bridge, above, just curve for no particular reason. With no regard for getting people where they want to go. Instead, there seems to be a distinct focus on increasing travel times by creating a mobility obstacle course. Speaking of obstacles, it was surprising to see that designs were actually sent in that just discarded the idea of ramps altogether and rolled their dice on... stairs. Big, fancy, modern bridge across the river of a major world city and you have to navigate stairs to get there. Although some designs feature elevators to further slow you down and one chucked in escalators for bikes. 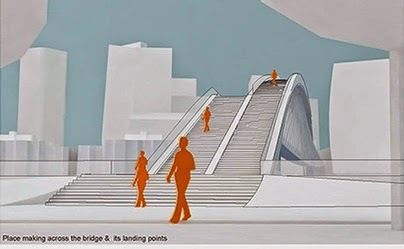 One of the designs has a small box in the corner showing the Everest slope and upselling it by declaring the intention to implement "Place making across the bridge and its landing position". Just look at the place they imagine making. Ooh. Sticky. If you want to create a bicycle and pedestrian bridge in 2015, can we agree that stairs and elevators should not be your point of departure? A lot of the renderings only provide conceptual ideas and it's sometimes hard to see details. Nevertheless, it wasn't all squiggletecture, curve balls and epic climbing expeditions. There are designs that make sense. There seem to be some common denominators. One of them is that the designer/architect has probably actually tried to ride a bicycle in a city. Another is a clear separation between the two user groups. The design at top left does so rather elegantly, with a cycle track down the middle. As does the design at bottom left. At bottom right is a design similar to what you see over the Brooklyn Bridge. Doesn't make it a good thing, but at least the designer was thinking about A2B and dividing space between cyclists and pedestrians. I was going to start commenting on which design(s) I like, but then I remembered I said I wouldn't that at the beginning of the article. So nevermind. What is going to work, regardless of design, is a bridge that provides an intelligent A2B without irritations or detours at either end. A bridge that understands pedestrians and their needs and expectations, absolutely, but also one that does the same for cyclists. Again, that's bascially almost every city bridge ever built prior to the dawn of automobile culture. "...it must be functional in its design, perfect in its execution and also inspiring and elegant." It's a modern lifeline across a river in a world city, not a coffee cup. Functional design first or don't bother.